If you can't find these names on the maps, it is not the fault of the cartographer. Altar Room was named by Yuri Bolotin; whilst Mt Tricky West is made up by me just now! Don't know how the name Cathedral Pass originated. Despite Altar Room not being on the maps, it is a fascinating place to walk through ... 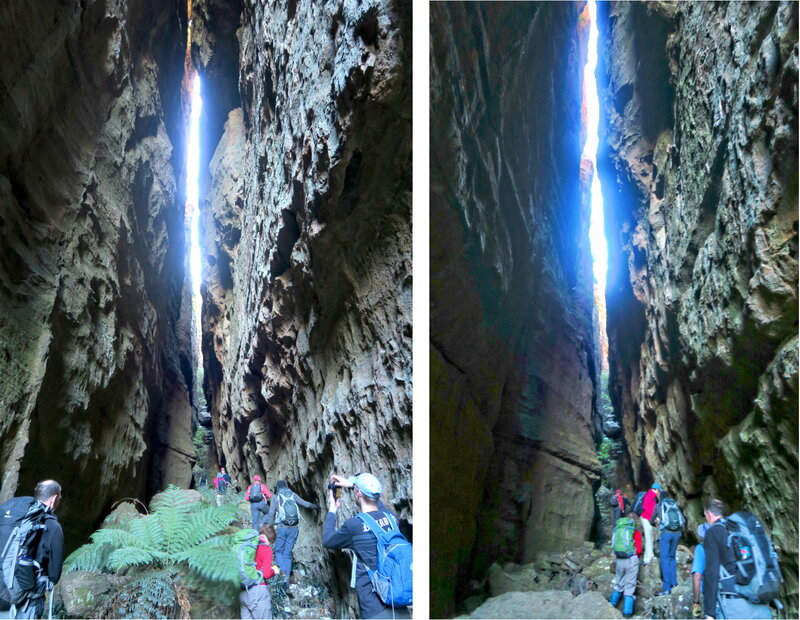 It is a slot about 160 meters long, linking Little Capertee Creek from below to the crest above which divides the Little Capertee Creek from Canobla Creek. Scroll down to the 2nd map below ... it is between the 2 blue arrows on the left side of the map. Cathedral Pass is the access from Little Capertee Creek Camping Ground to the east side of Mount Tricky West ... scroll down to the 2nd map below ... it is between the 2 blue arrows on the right side of the map. Here is the 1:25,000 scaled map of the relevant part of today's walk. The tracklog, red colour, clockwise direction, superimposed on the 1:25,000 scaled map. - The 2 blue arrows on the left point to start and end of The Altar. - The 2 blue arrows on the right point to start and end of Cathedral Pass. - The red arrow points to Mt Tricky West summit, around 990 meters. - The walk ends at Newes Camping Ground. As the staring point of our walk is different from the end point, a car shuffle is required. However the distance between the 2 points is not great, one could have completed the circuit simply by walking. Refer to the above topographic map for explanations on the circle & arrows icons. 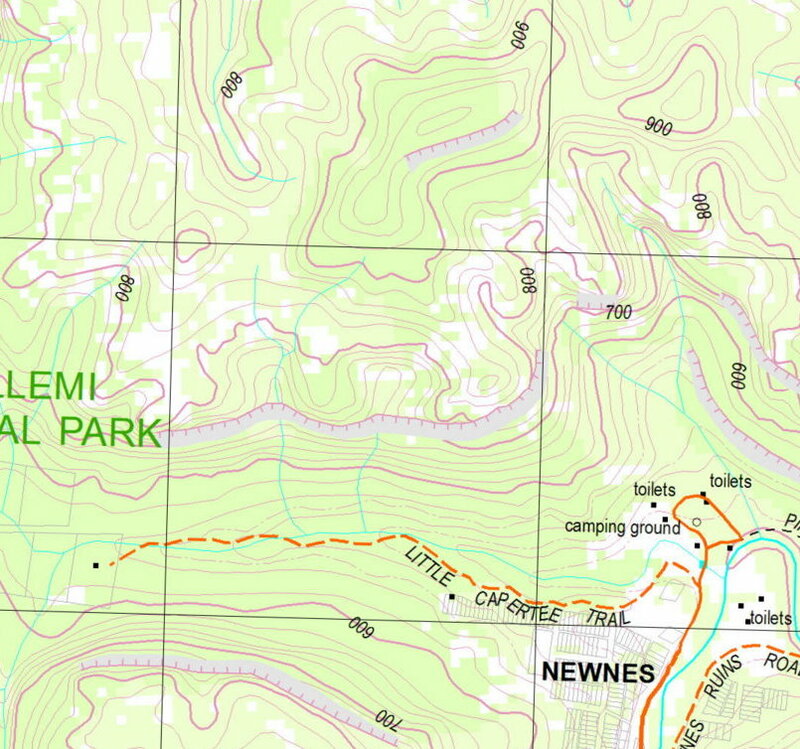 - Start at a point 1.5km by car from Newnes Hotel ... blue circle in the above map, Grid Reference 417 261. - Walk westward, on track for 600 meters. - Then off track, then go north to Altar Room. 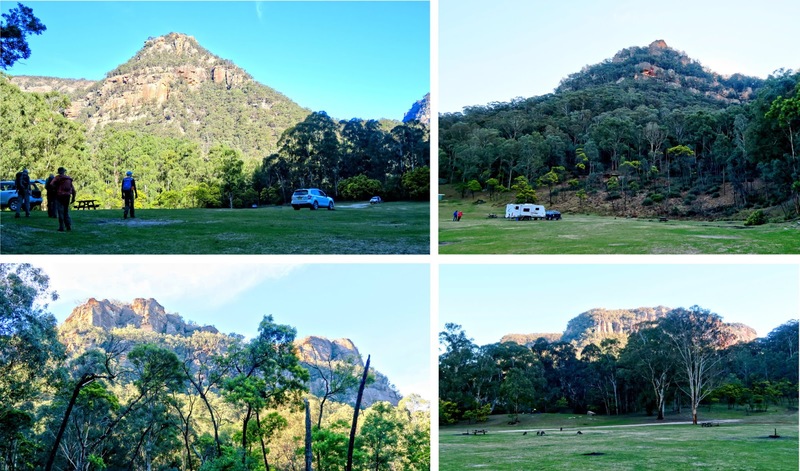 - Return to Newnes Camping Ground via Cathedral Pass. 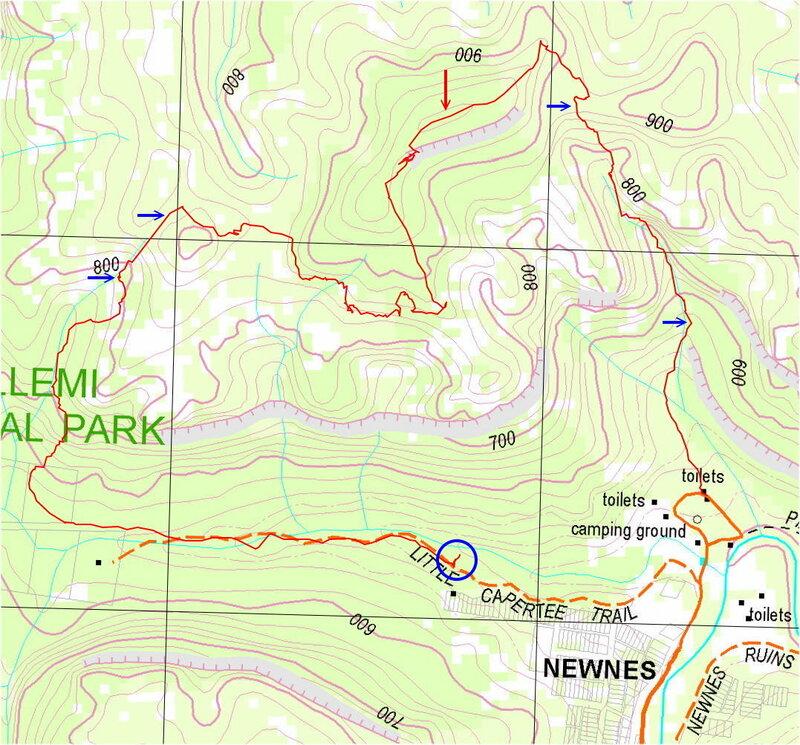 09:17 0.0 km Start at a point 1.5km by car from Newnes Hotel ... blue circle in the above map (GR 417 261). Here, we pick up Thomas Ebersoll, owner of the hotel - he is joining us for this walk too ! 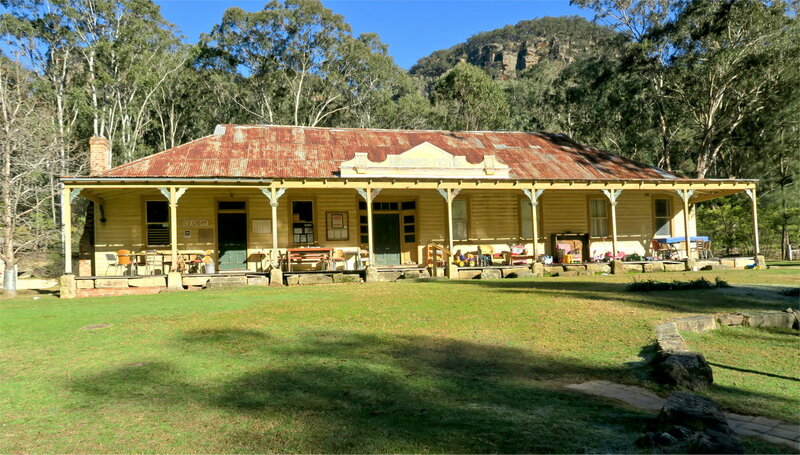 By the way, since Thomas bought the place, he has vastly refurbished the hotel and added modern accommodation ... well worth a stay, and take the opportunity to enjoy the beauty of Wollemi National Park. 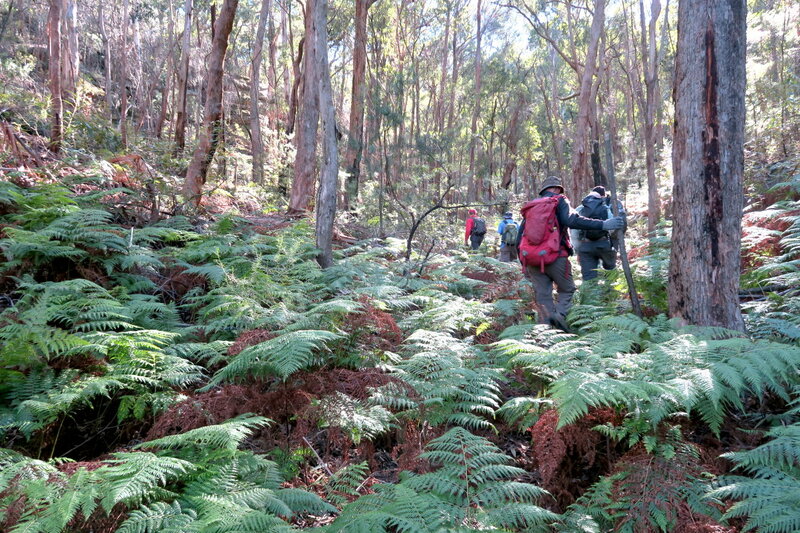 2) The starting point of our walk is about 1.5km by car from the Newnes Hotel. Here Yuri is briefing us on the walk. 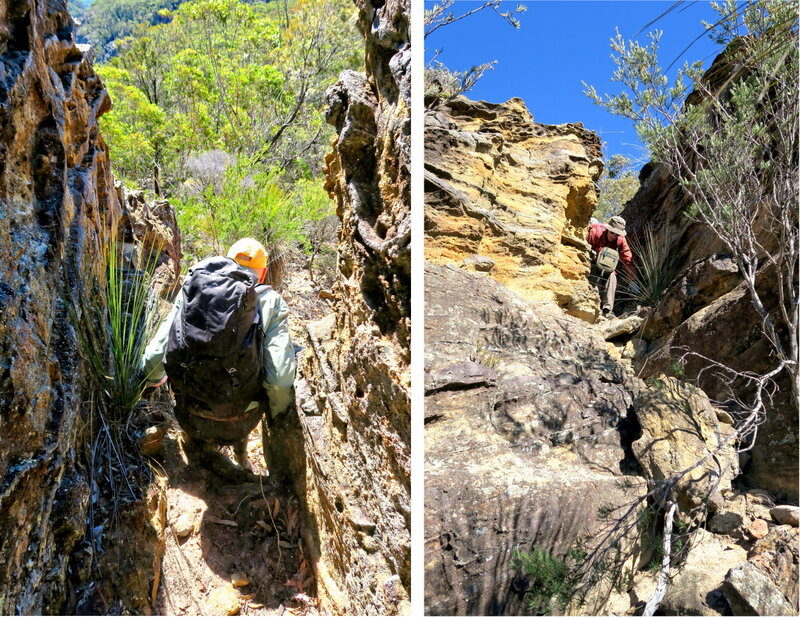 3) We walk on a track westward for about 600 meters, 8 minutes; then it is off track to climb up the cliffs above Newnes. The vegetation is quite thin ... easy to walk through. - This pic is looking backward. IS is leading, followed by HT. 4) Then we come to the cliffs and walk along side the base. 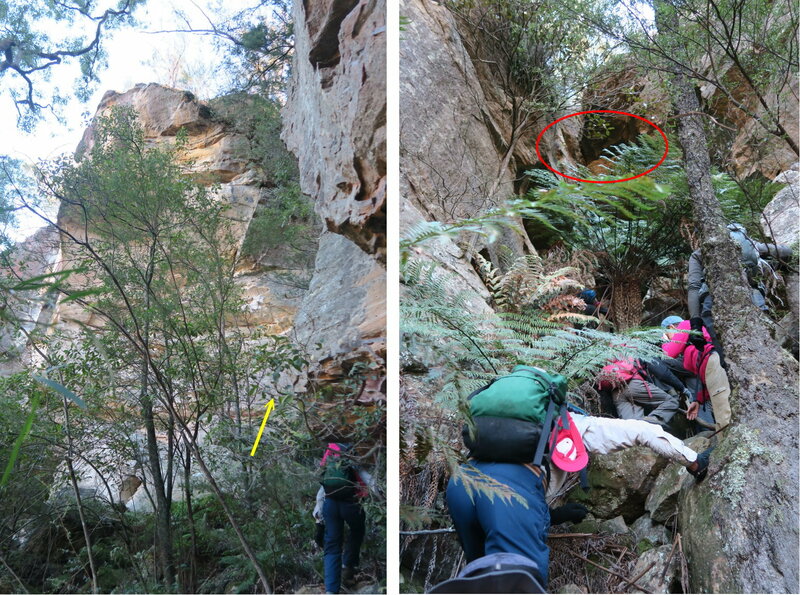 5) - Left pic: The yellow arrow points to a gap through which we are going to climb up the cliff. 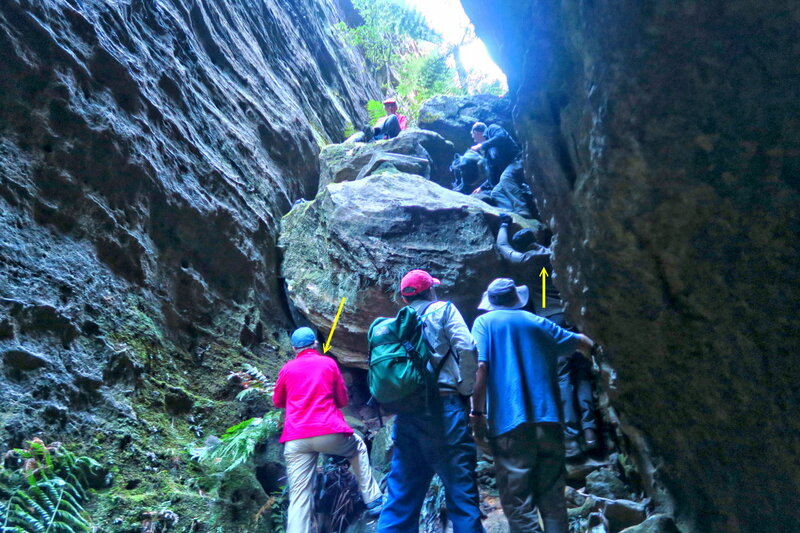 9) Straight after the tunnel, there is a short vertical climb. 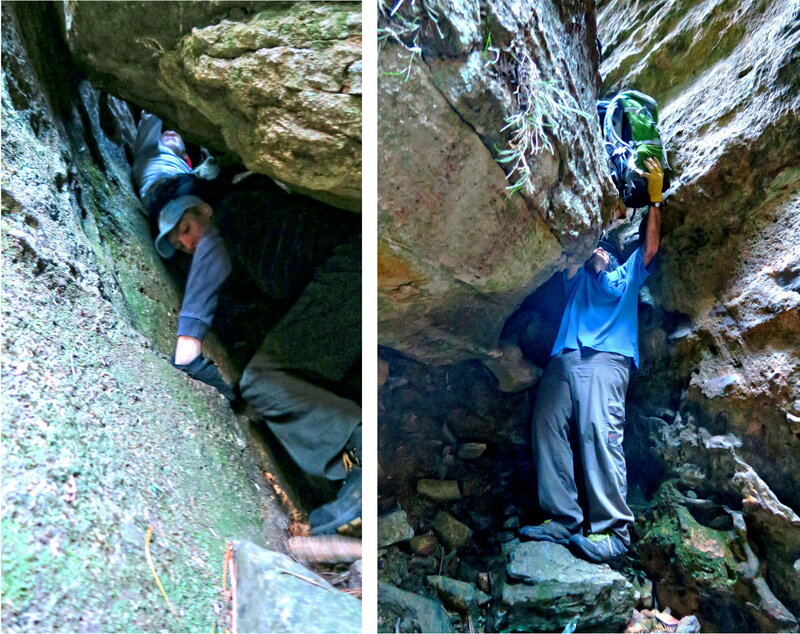 - Left pic: RA is climbing up. JR is already at the top. 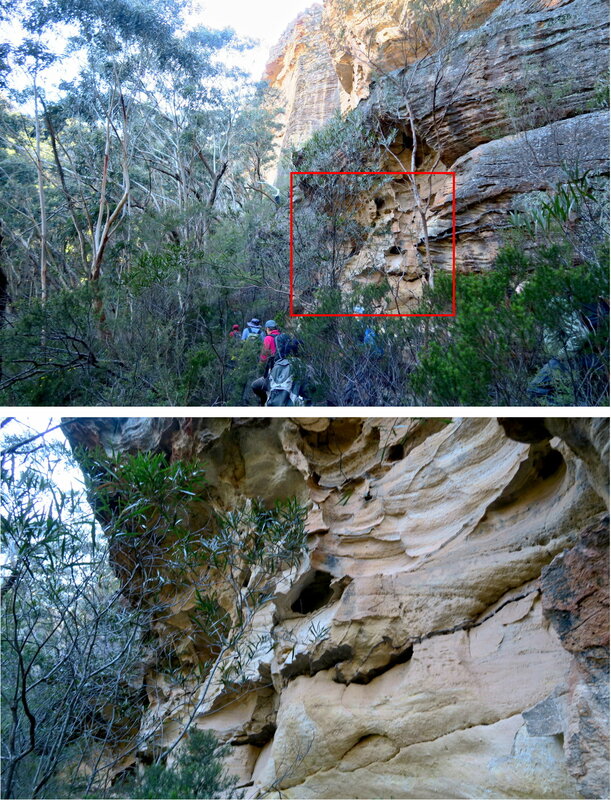 • RA is taking photos of the vertical climb of the left pic ... where he has just climbed up. 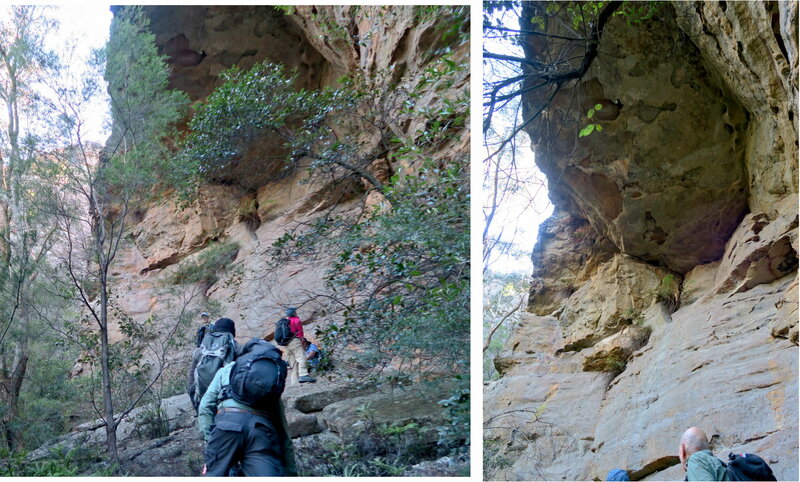 10) After the climb of the previous pic, we are in a more sunny area ... it has a sort of magical tranquil atmosphere ... I like it ! - Yuri Bolotin is leading, followed by DD. At the rear is HT with his red backpack. 13) ... and we hug along it. The bottom pic is the red square of the upper pic. In both pics, the guy nearest to the camera is Michael Keats. 15) Entering Altar Room, it is a long narrow slot, most interesting ! 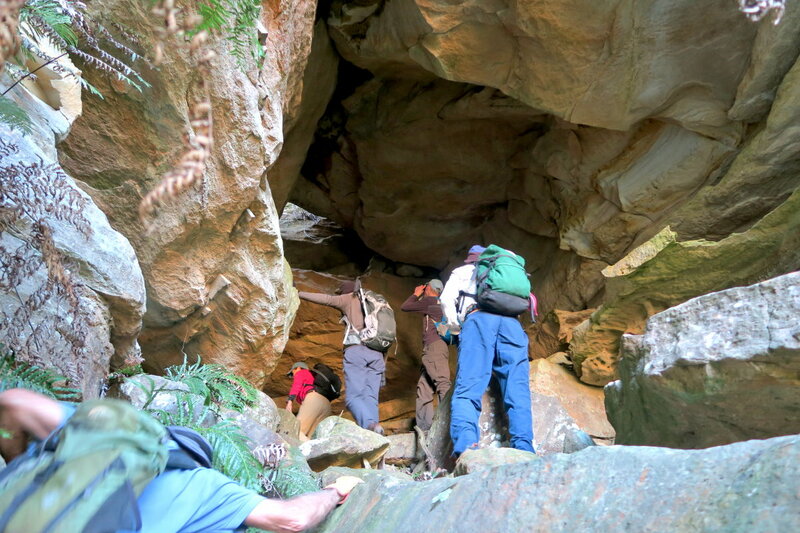 Here, we need to get up some rocks, either by brute force climbing (call it the high way, yellow arrow) or chimneying up through a short tunnel (called the low way, yellow circle). Brian Fox, Yuri Bolotin and perhaps one or two other guys choose the high way. The others go through the low way. 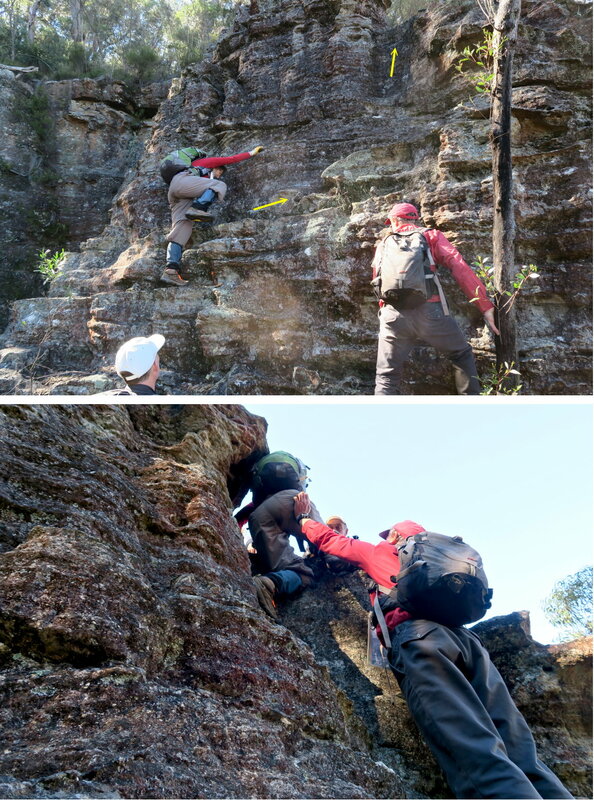 - Left pic: Brian Fox is already on top of the rock, RA is inspecting which option he should take. NlC is at the rear. - Right pic, left to right: NlC, RA. 16) I go through the tunnel. - Upper pic: NlC is well inside the tunnel. 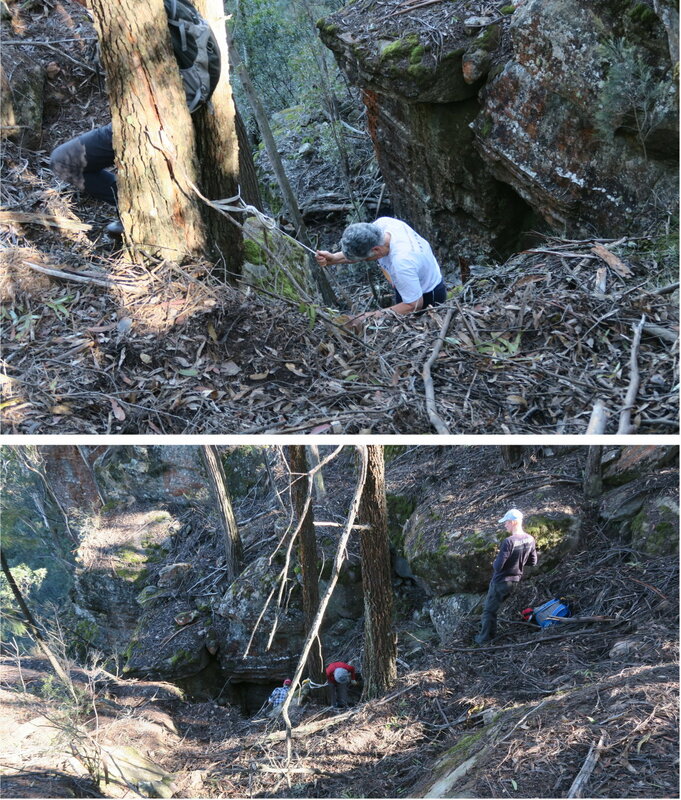 - Lower pic: I've chimneyed up the tunnel and looking down at KB emerging out. 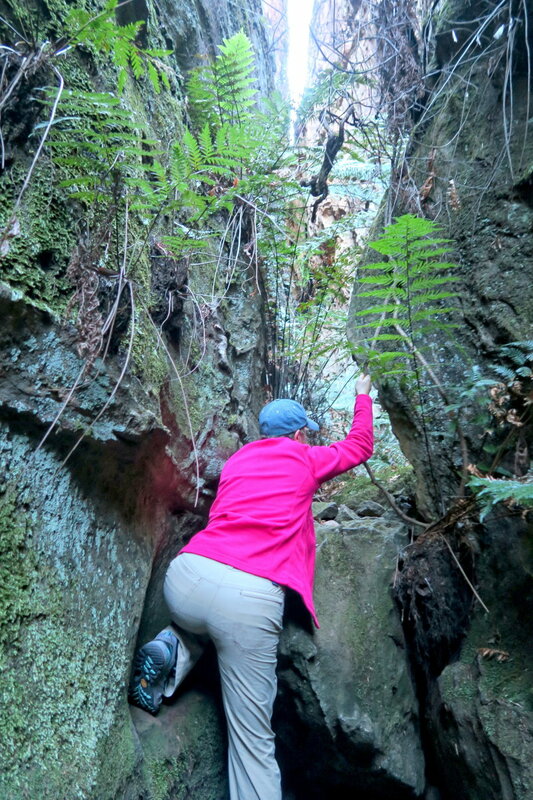 17) Straight after the tunnel, a short climb up a rock - NlC is showing us how to do it ... grab onto a vine. 18) The Altar Room ... isn't it a fantastic slot ! • DW is at the bottom left corner. RA is at the bottom right corner. • Between them is KB in red. • JR is in front KB; and Yuri Bolotin is in front of JR.
- Right pic: DW is nearest to the camera. 19) The magnificent Altar Room ! - In both pics, DD is nearest to the camera. 21) It is a beautiful place, just magic ! - Left pic: HT. Further back is Thomas Ebersoll. - Right pic: SA. Further back is Thomas Ebersoll. The red square is photo #25. Brian Fox in red cap is on the left. Closer to the camera and on the right is DD in short sleeve blue t-shirt. 25) This is the red square of the previous pic. 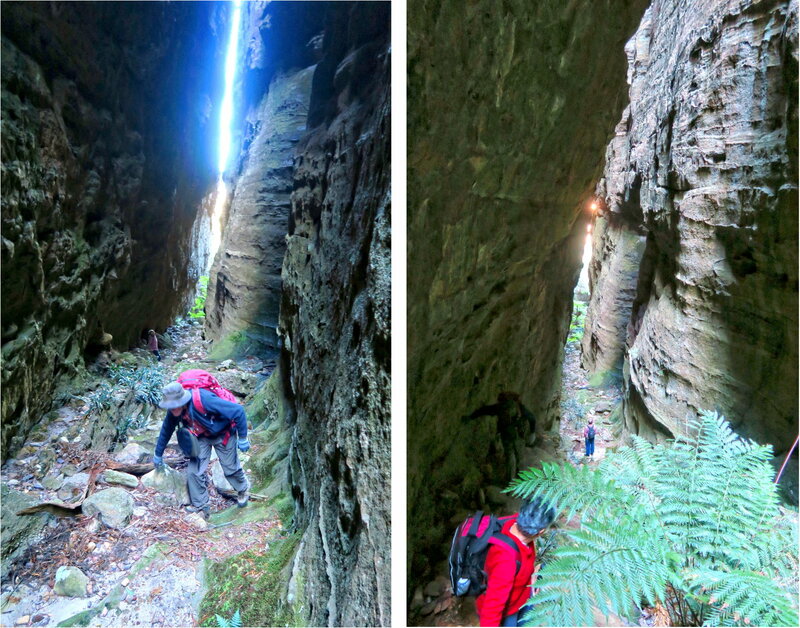 - Left pic, The low way, through the tunnel: RA is in front of me. IS (?? ?, not sure) is ahead of RA. 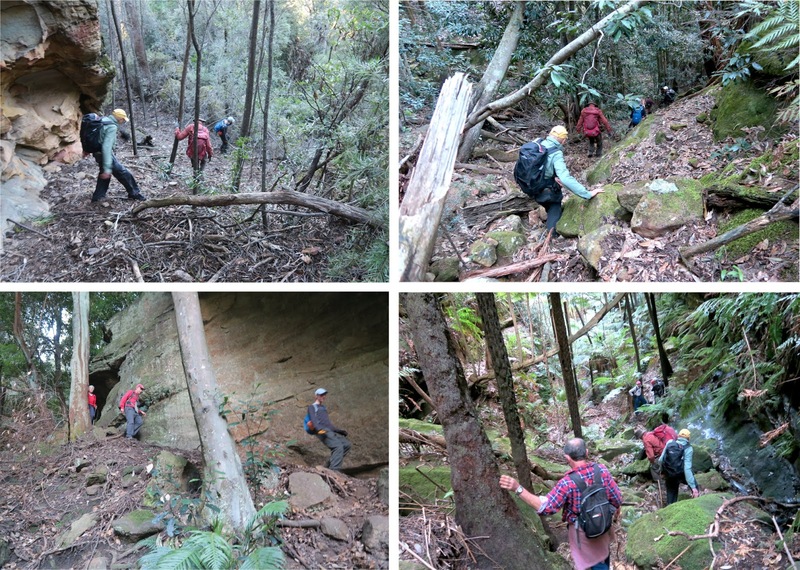 - Right pic, the high way, this is where you climb up if you don't take the tunnel option: DD is helping to put someone else's backpack over the rock. He himself may have taken the tunnel option too. 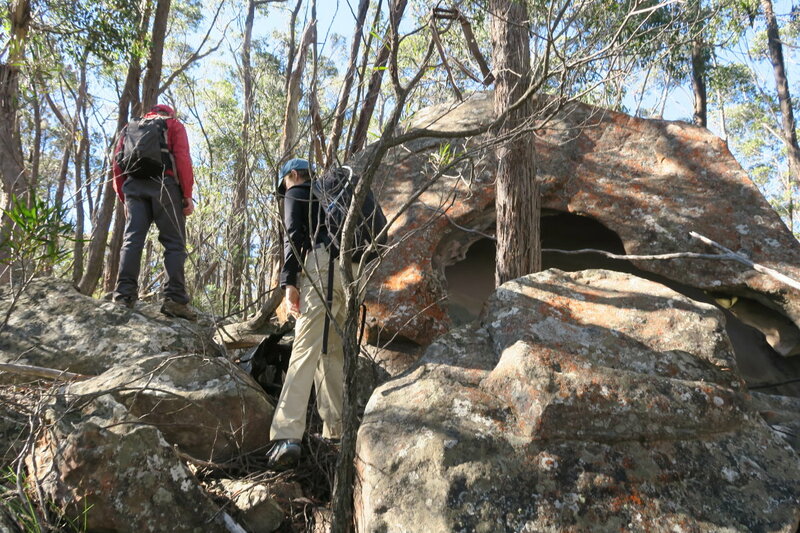 27) I have chimneyed up the tunnel and is now on top of the rocks and looking back down at the Altar Room. - DD is close to the camera. - Yuri Bolotin in red is helping people to get up the tunnel. 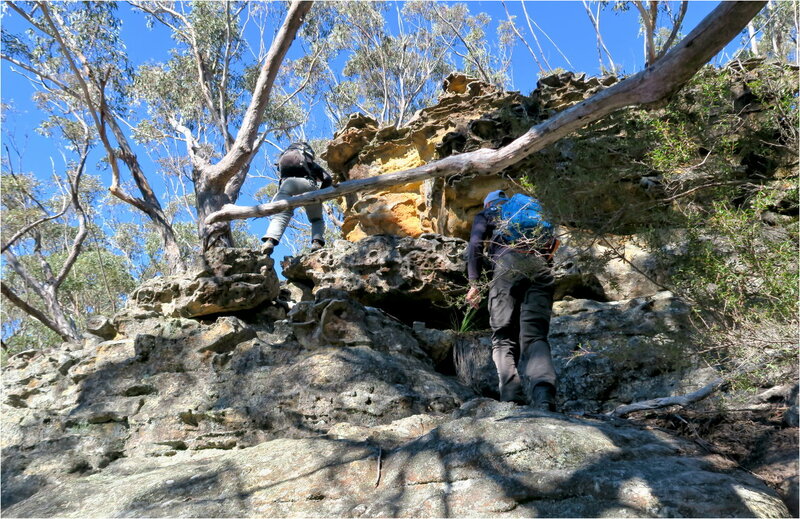 28) Once we have climbed up the rock (previous pic), it is then less than 5 minutes to climb up to a saddle point where we'll have morning tea. 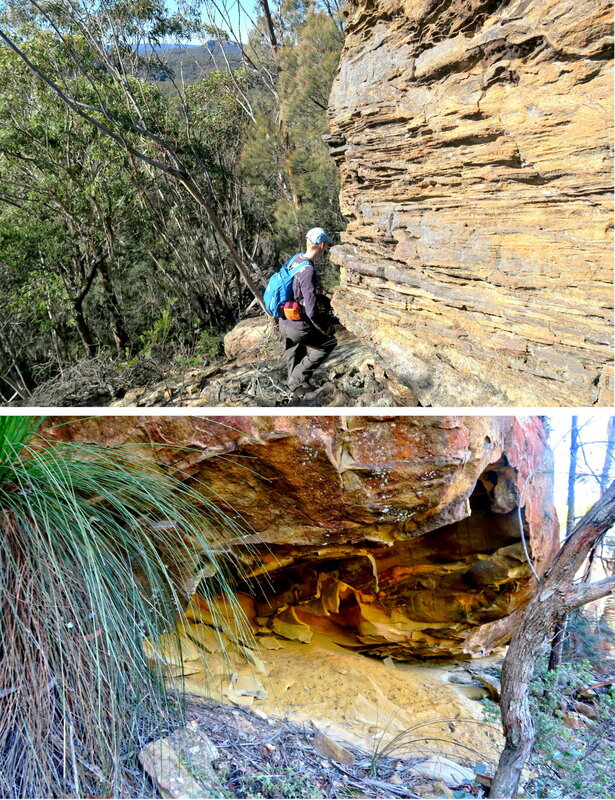 - Left pic: RA on the way to the saddle point. - Right pic: Looking back at SA. 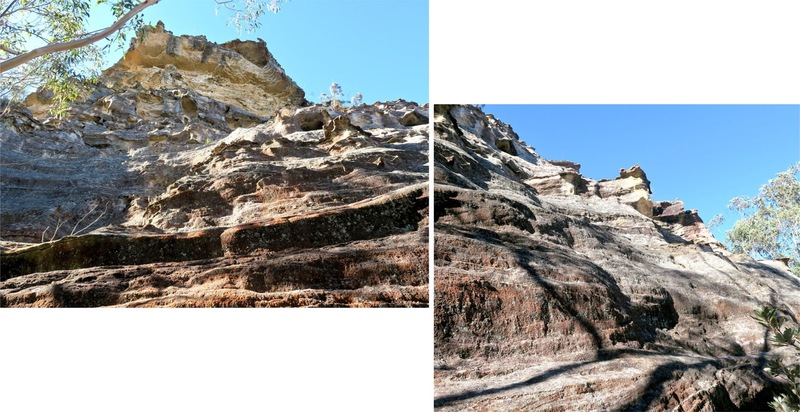 - Lower pic: DD sitting on top of the rock, IS is below him. 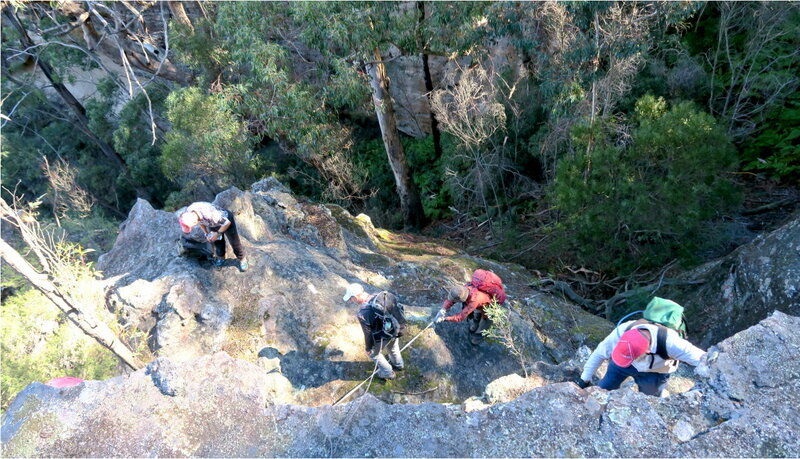 30) After morning tea, it is off to climb Mt Tricky West. 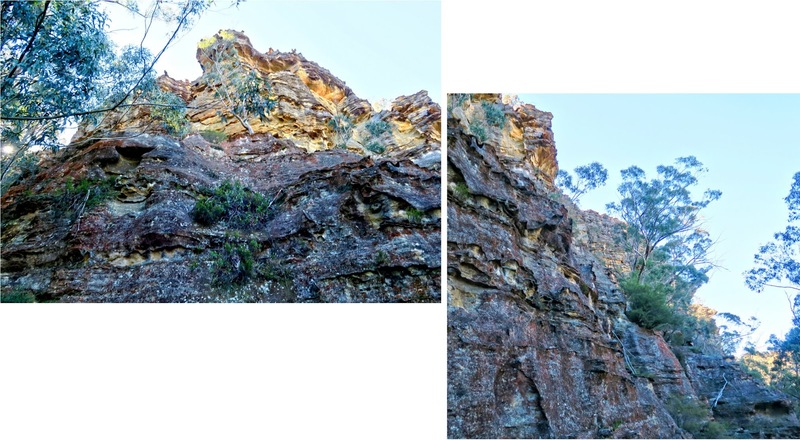 This pic is taken very near where we had our morning tea ... in fact it is taken just behind the rock where DD was sitting in the previous photo. 32) ... it has a nice view. Towards east is Mt Tricky West's western slope. We are going to climb this hill ... it is a small one and doesn't deserve to be called a mountain :-) We won't climb it by going directly ahead; rather we'll hug along side the cliffs towards the right until we reach its southern tip, then we'll turn north to climb up. - Altar Room runs from behind the hill on the right side of the pic towards bottom left corner. 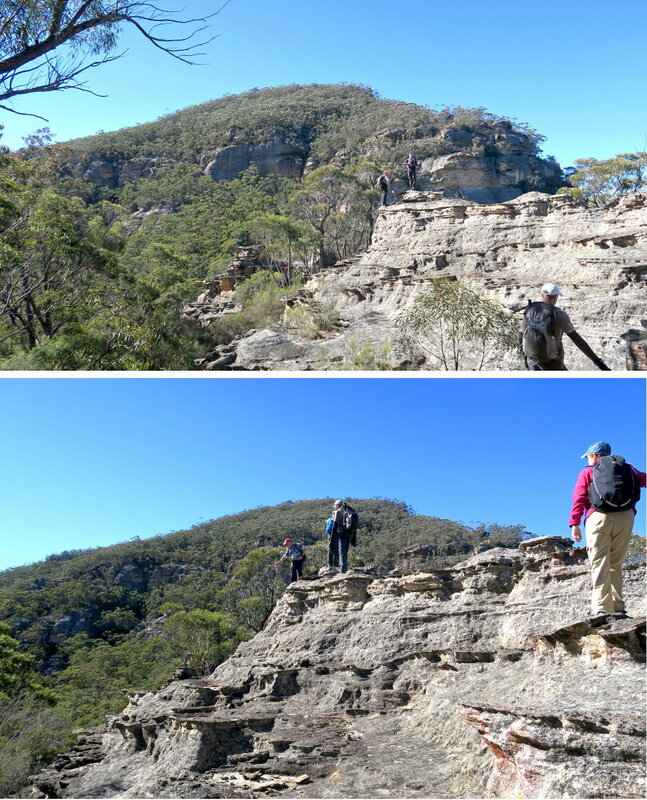 - The yellow arrows are how we reach this pagoda lookout. - The 2 small figures are HT and IS. 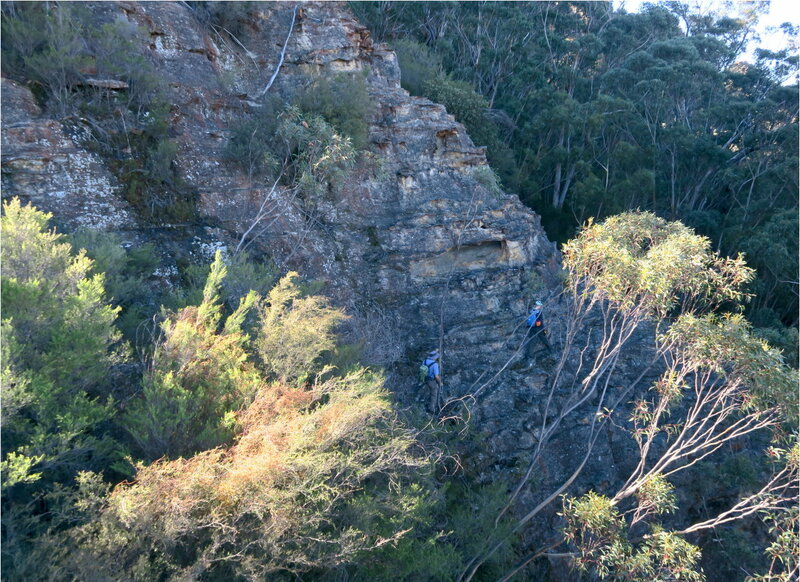 37) Still hugging along the southern cliffs of Mt Tricky West. - Altar Room is just behind the hill pointed to by the red arrow. 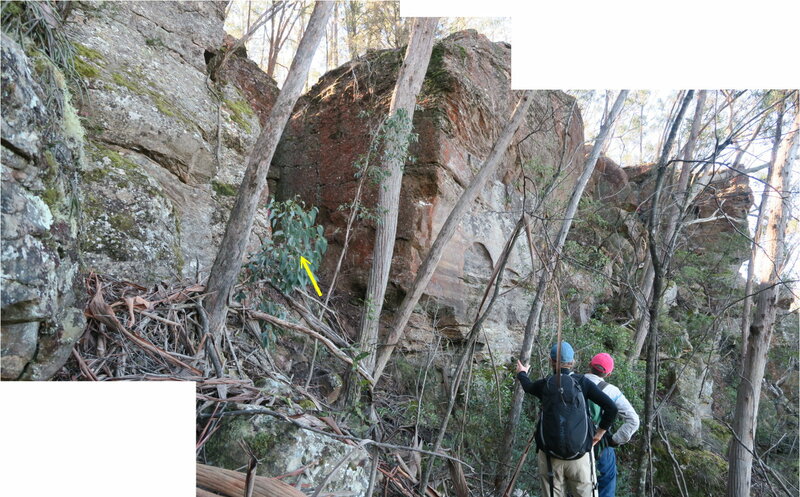 - The red oval is where I was standing when taking photo #38. - The small figure on the left side of the pic is Brian Fox. 40) At the same spot where I take the previous photo, I snap this one. 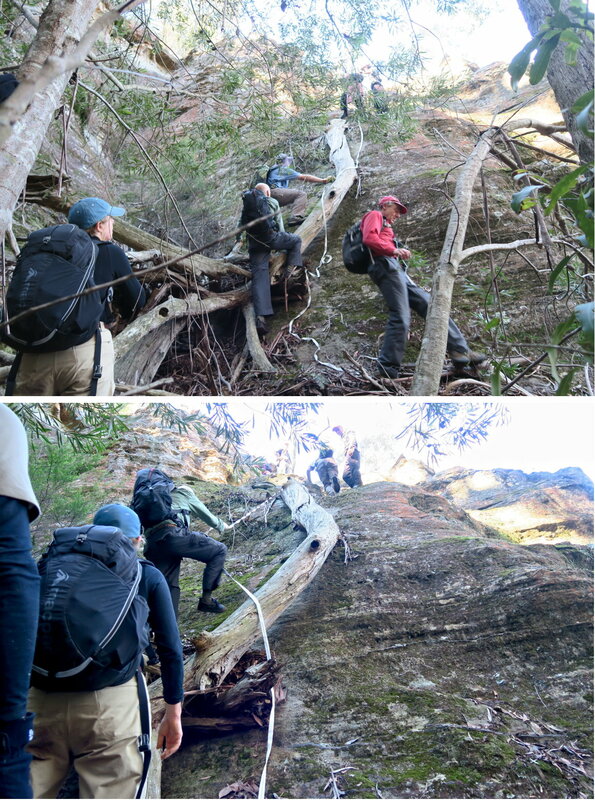 Just don't misplace your foot when crossing the cliffs ... see photo #41 as well ! 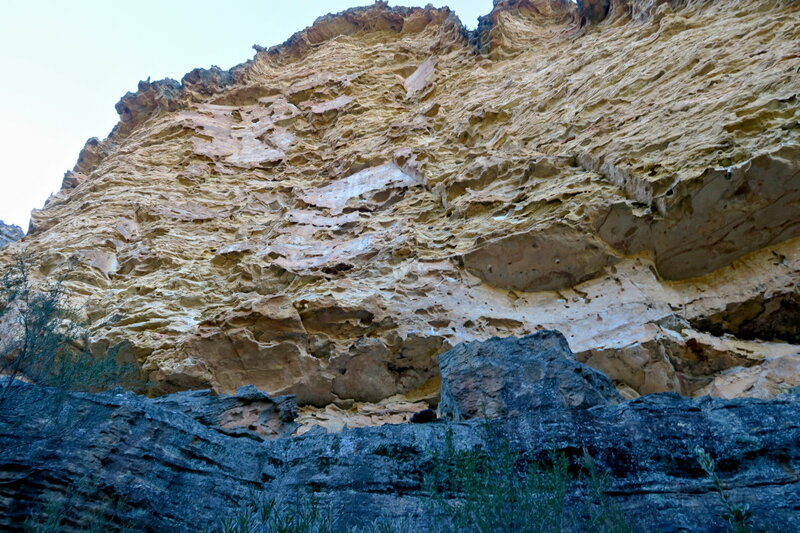 41) These are the cliffs of the previous pic. 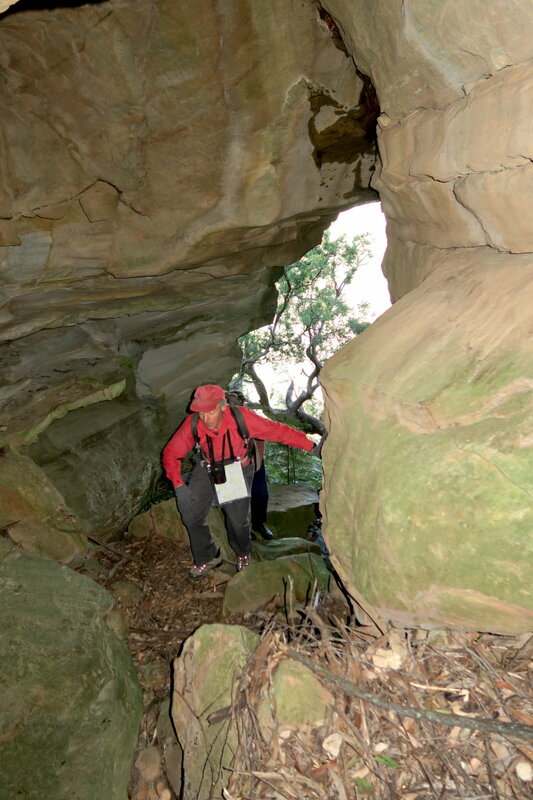 42) We are still at the southern side of Mt Tricky West and its cliffs. 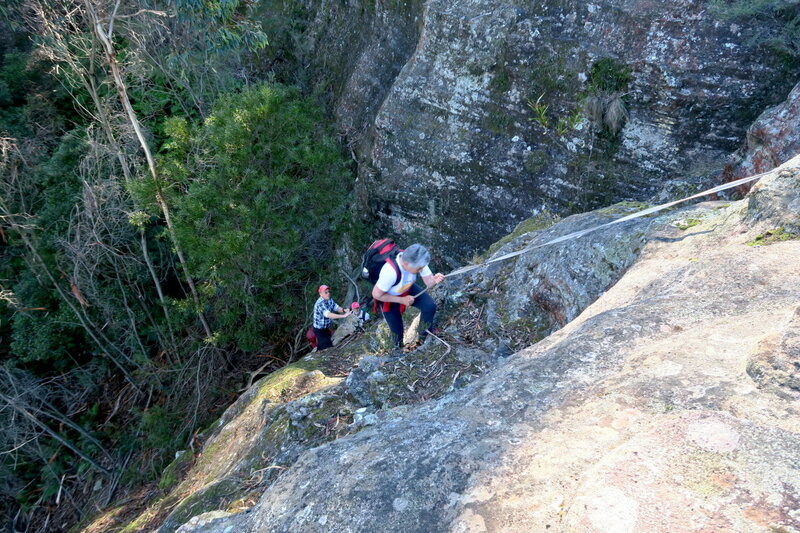 44) Still at the southern side of Mt Tricky West and looking at its cliffs. 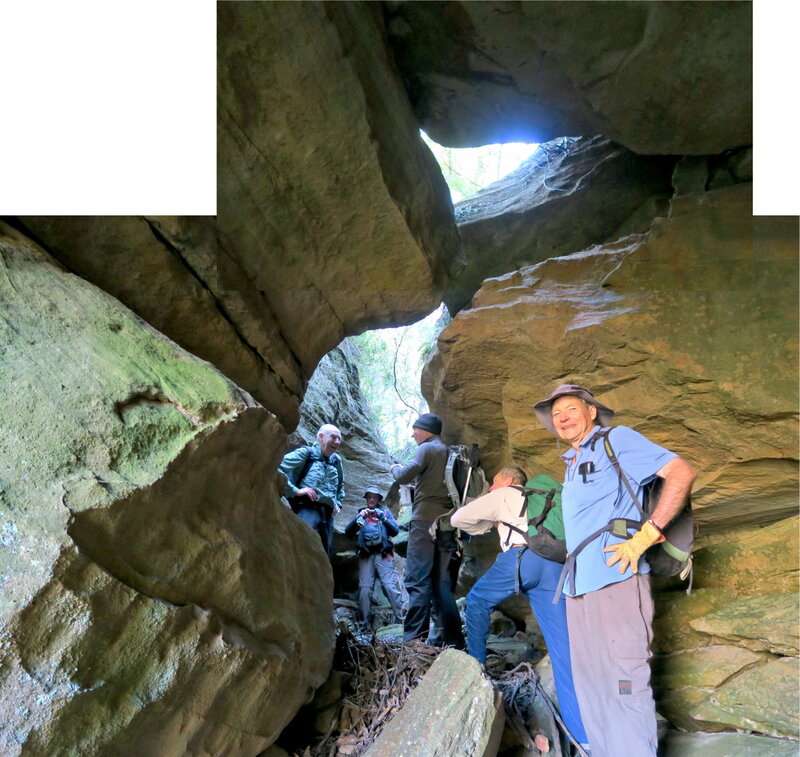 45) Going into a short gully, the end of which is banded cliff ... see photo #46. 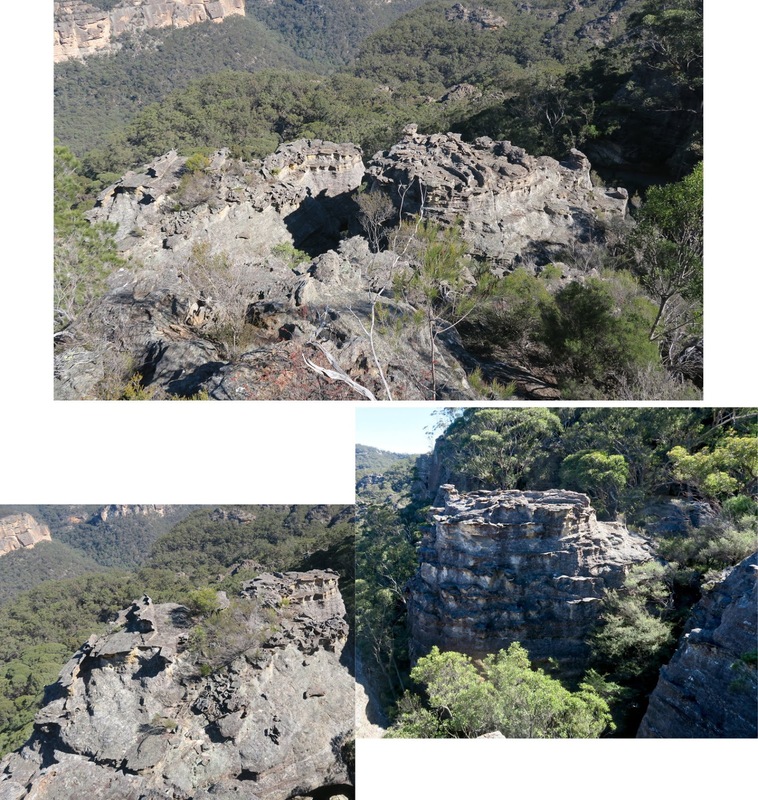 We are going to climb up the cliffs, not directly ahead, but beyond the right edge of these photos. 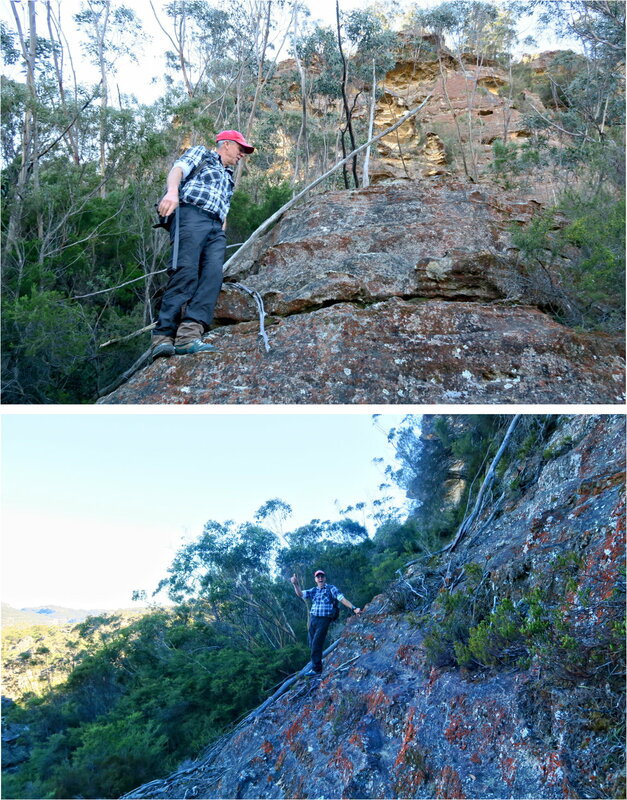 47) Brian Fox kindly climbed up the cliff and dropped down a climbing tape for us. 48) I've climbed up and looking back down at SA grabbing onto the tape. Brian Fox is behind her, and IS is further back. 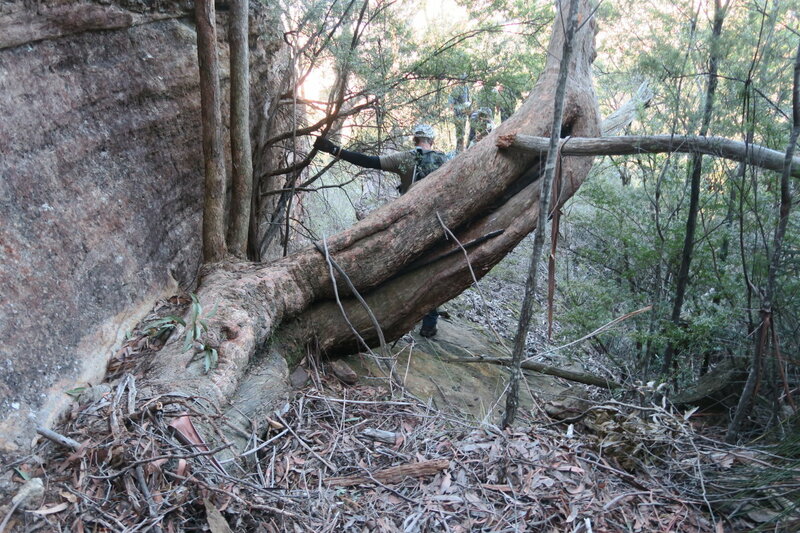 49) Straight after the tape, it is climbing up another cliff like a Spiderman. 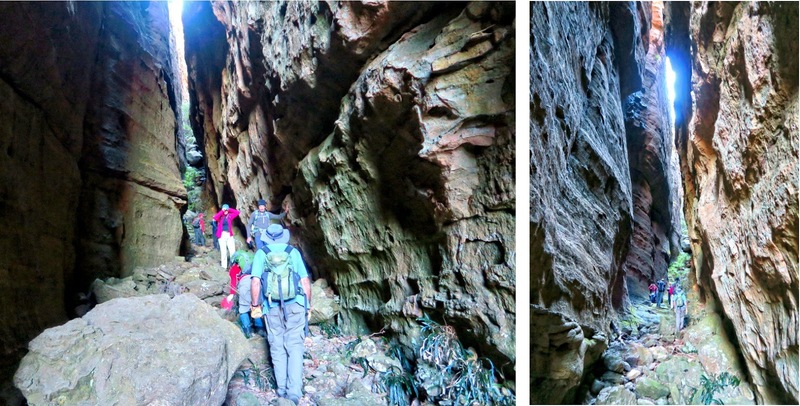 • The way up is indicated by the yellow arrows. • Yuri Bolotin (on the right) and DW are watching. - Lower pic: Yuri Bolotin is pushing KB up. 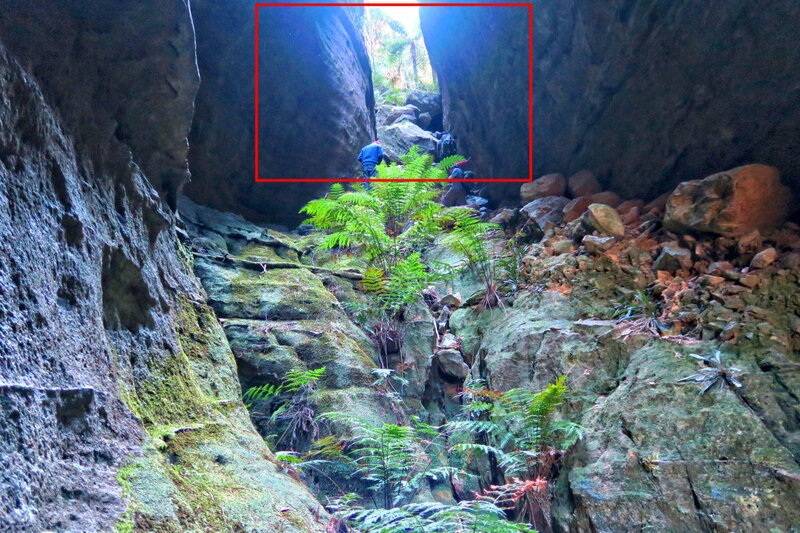 50) I've climbed up the cliff of the previous pic and now looking back down at IS climbing up. 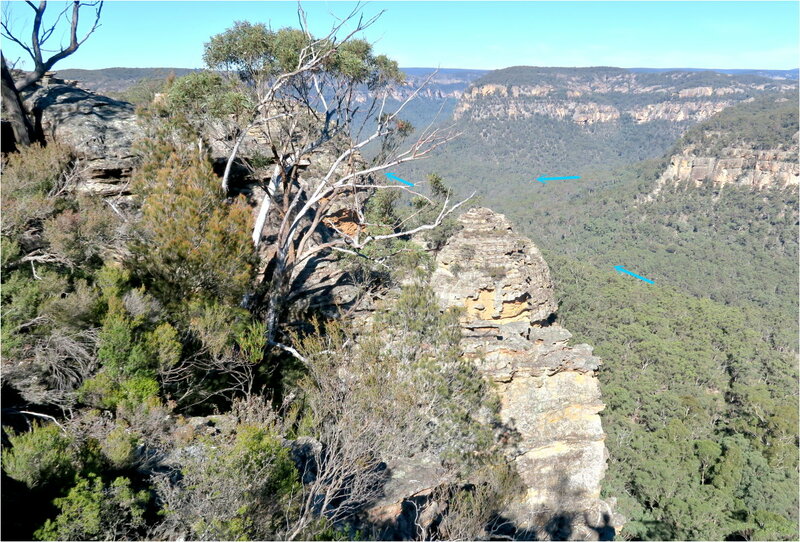 - Here, it is towards south-east at the confluence of Little Capertee Creek (turquoise arrow on the right) and Wolgan River (the other 2 arrows). 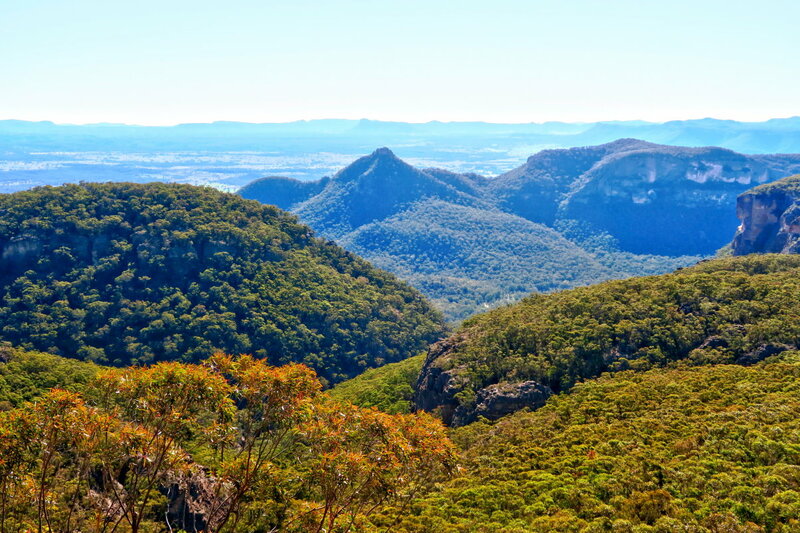 - Newnes is behind that good looking pagoda at the centre of the pic, hence we can't see it. 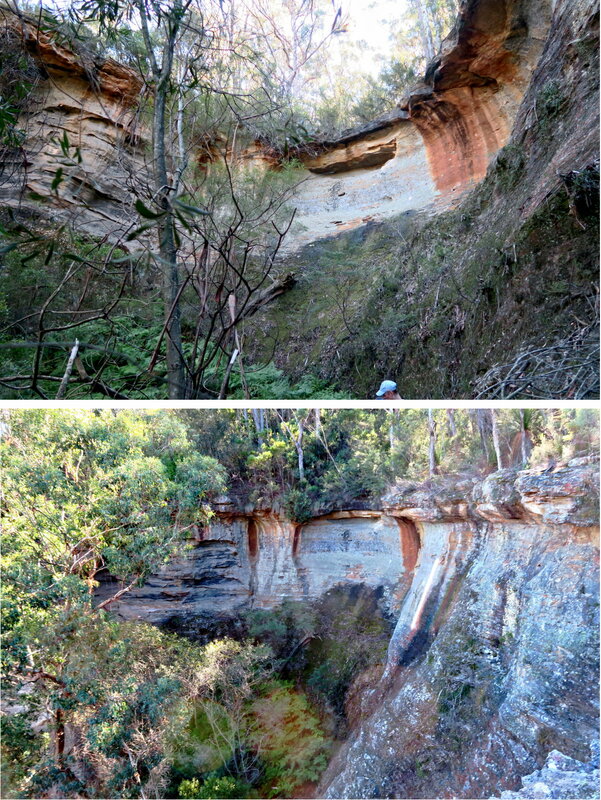 - This pic is similar to photo #38 and is towards the south and south-west, across Little Capertee Creek. - The red square is repeated in photo #53. Thomas has already decided to sit down and have lunch (GR 416 268). Some, including me follow suit. 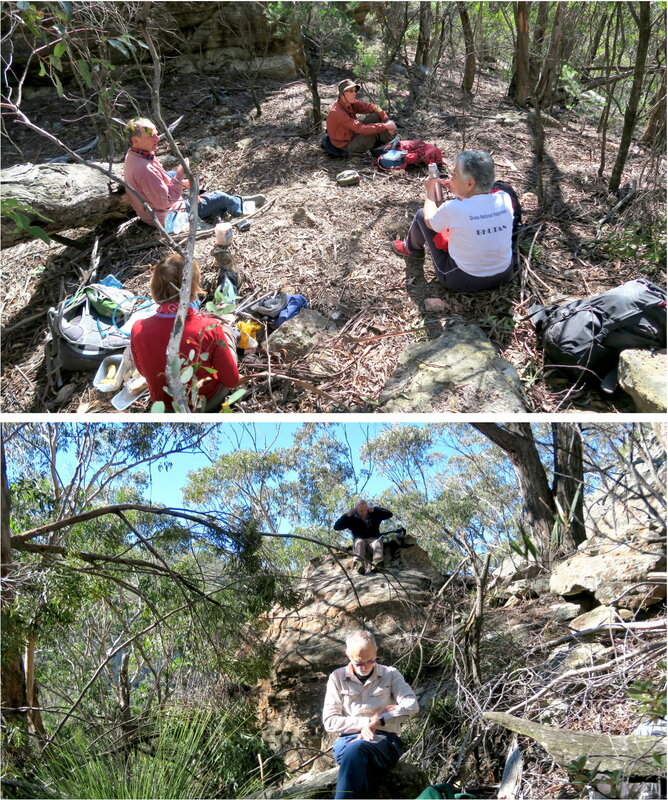 Yuri Bolotin, Brian Fox, Michael Keats and a few other go a little further and have lunch at another lookout spot. 53) The two photos below are of the same pagodas in the red square of the previous pic, but viewed from different angles. 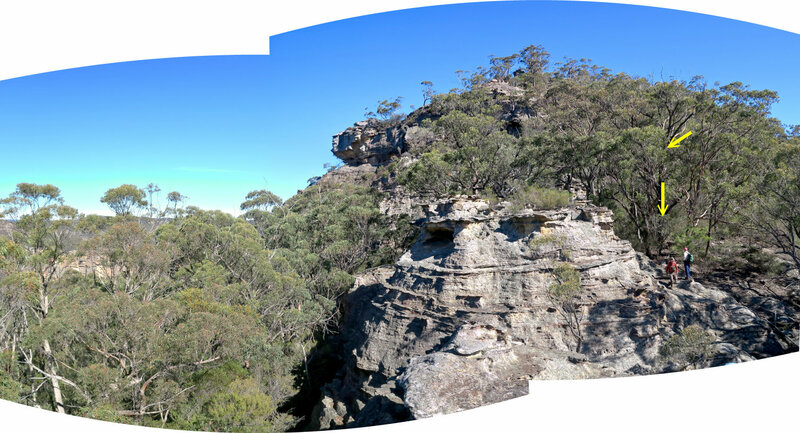 54) After lunch, we come to this lookout with a view towards east. 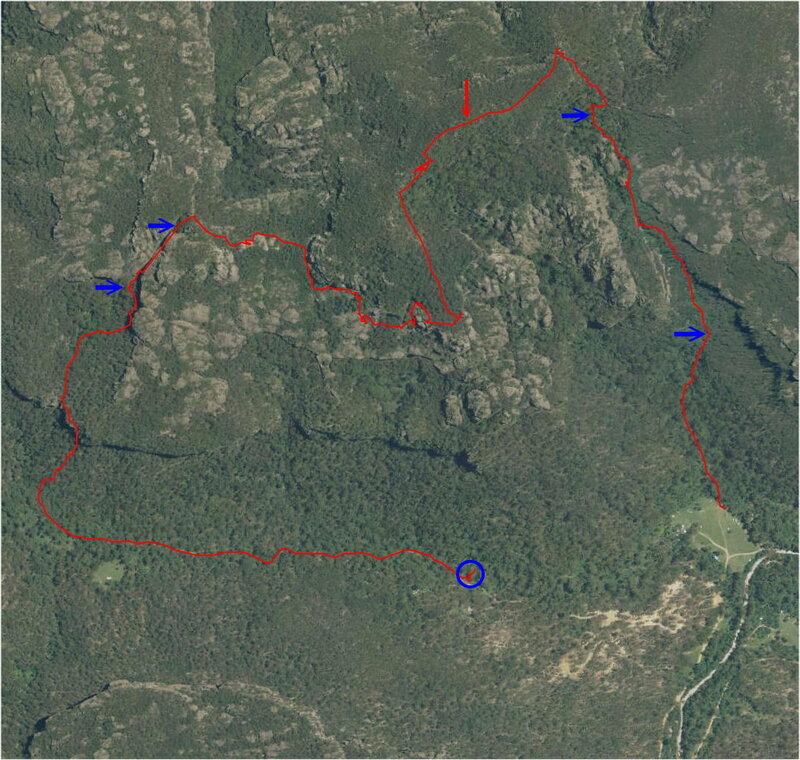 - Wolgan River flows along the red arrow. - In the red oval is Cathedral Pass, between the 2 cliffs. 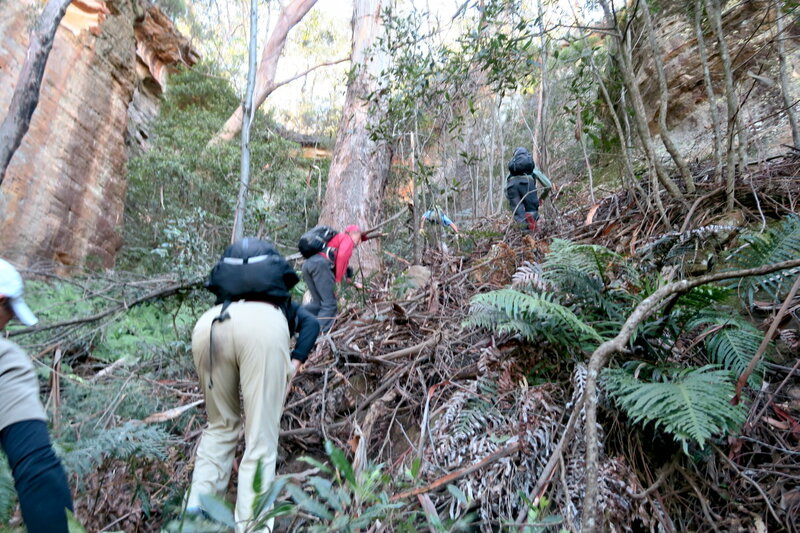 Later on, we'll go down the pass (from left to right) to return to Newnes. 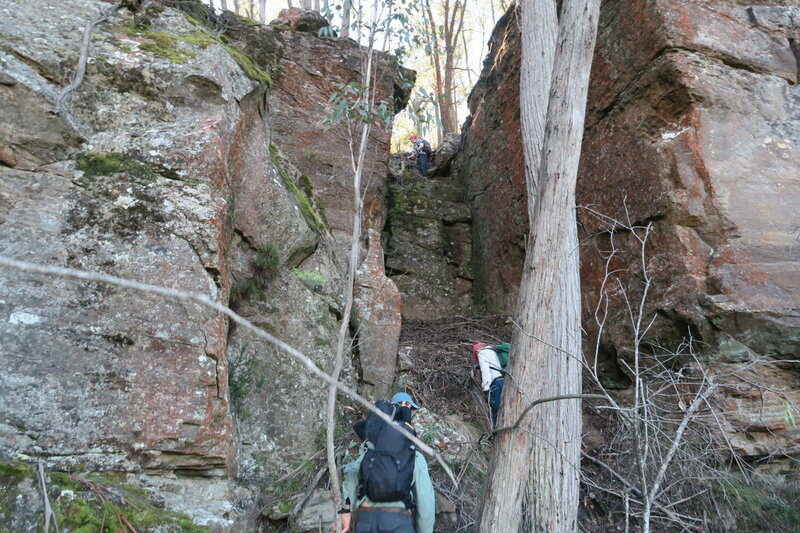 - We are still at the southern slope of Mt Tricky West. But from now on, we turn north-ish to climb towards the summit. 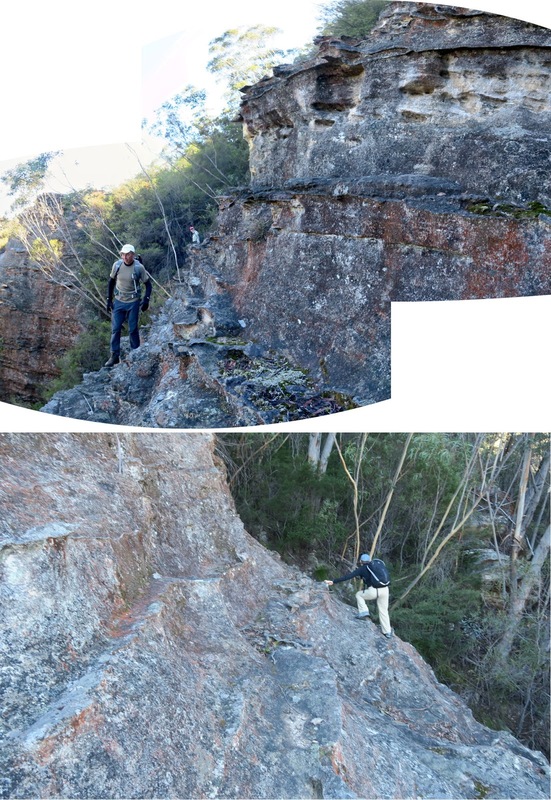 So far, we have been walking in a easterly-ish direction along the southern cliffs of Mt Tricky West. Now we turn north-ish to climb up. 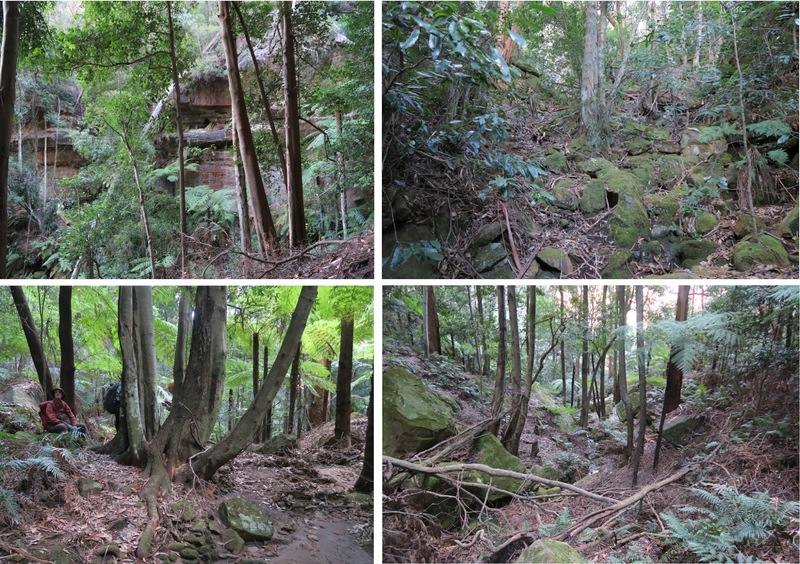 55) About 500 meters from the lookout in the previous pic, we come to this spot. 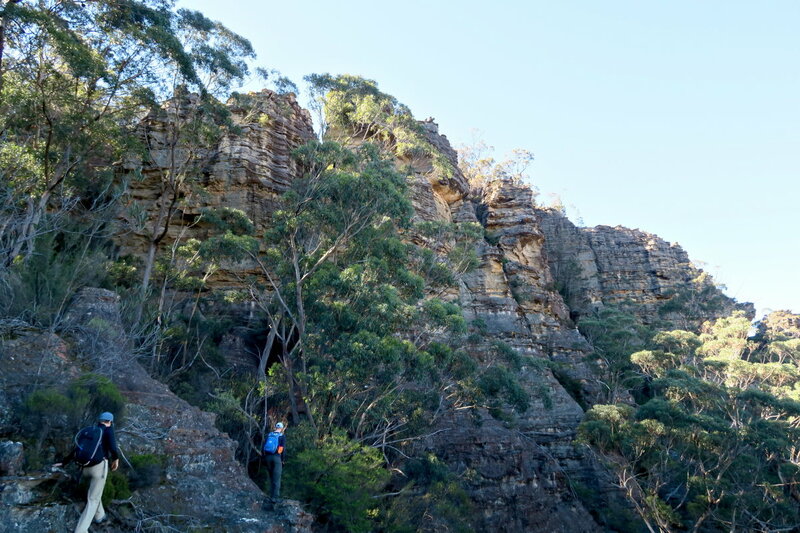 To climb to the top of Mt Tricky West means climbing up these cliffs. 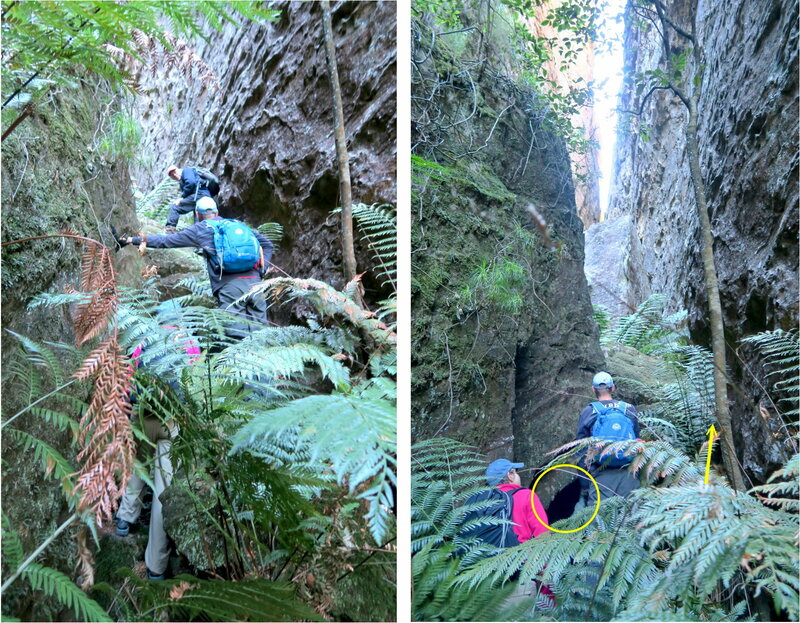 The way to do it is by going into the gap pointed to by the yellow arrow. 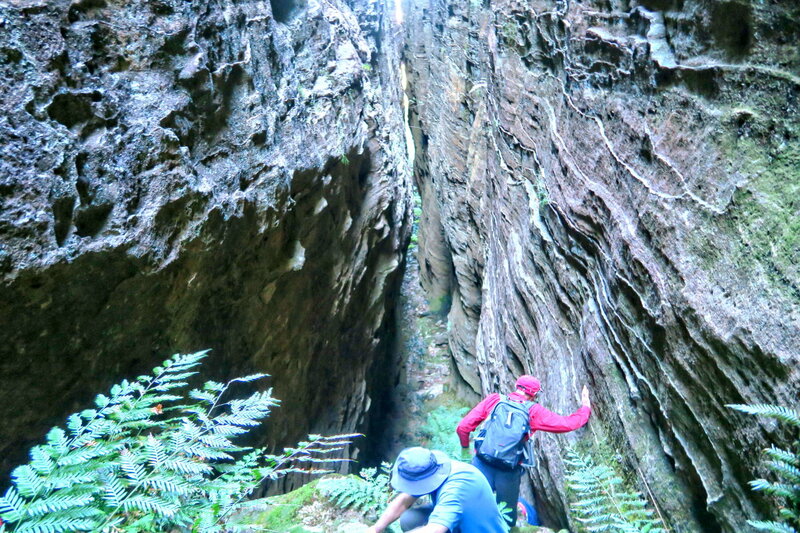 56) At the end of the gap is this vertical cliff. 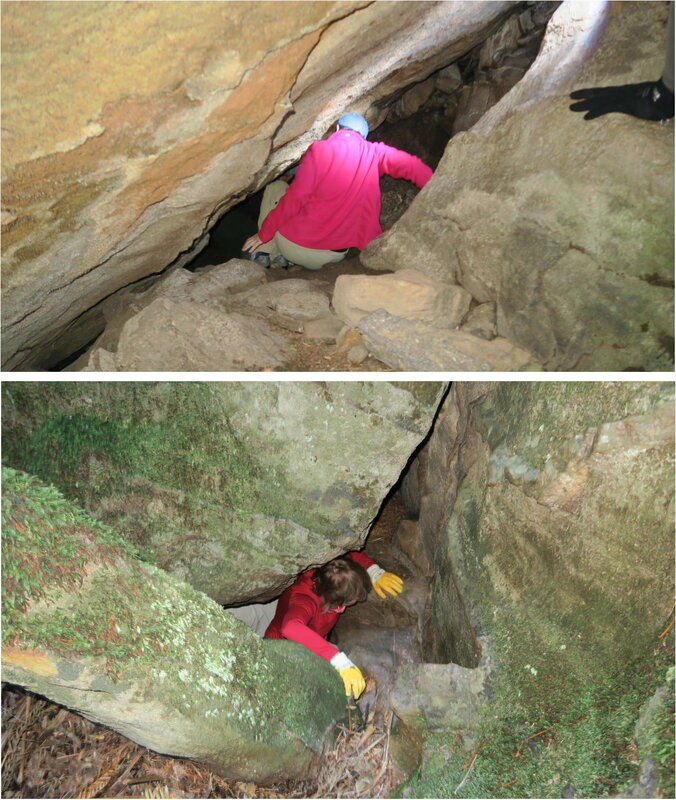 57) To climb up, we chimney up through a hole on the left. - Right pic: Brian Fox drops a tape down for us to use, but most of us go through the hole instead. 58) I am at the top of the cliff and looking back down. 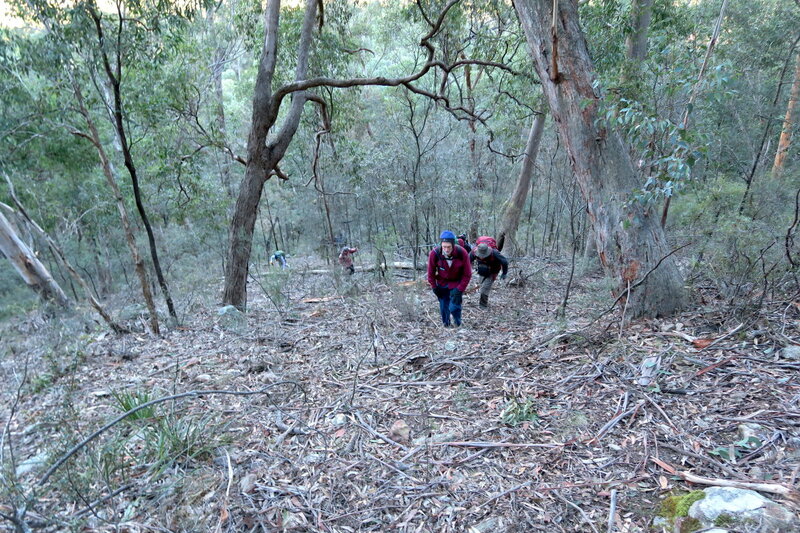 60) After the previous climb, we are now walking along the top of Mt Tricky West. It is quite flat at the top. 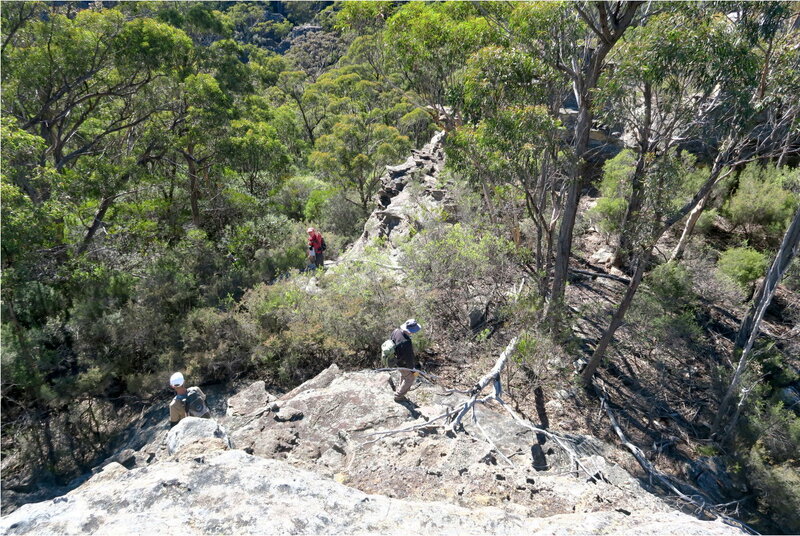 61) Walking through Mt Tricky West summit, around 990 meters ... you hardly notice here is the summit. 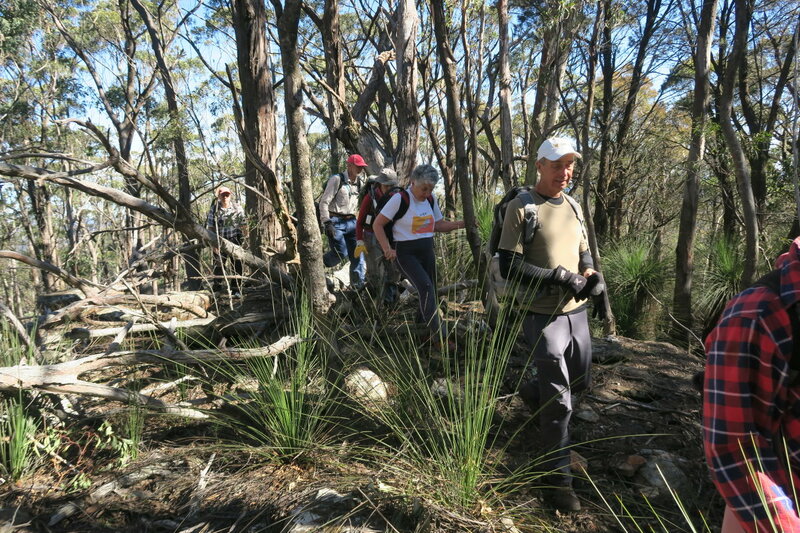 62) Still at the top of Mt Tricky West ... we come to a wonderful lookout (GR 419 275). This view is towards north-west ... actually from west to north. - The red arrow points to Mt Canobla. 63) Zooming into Mt Canobla of the previous pic - I would like to climb it one day. 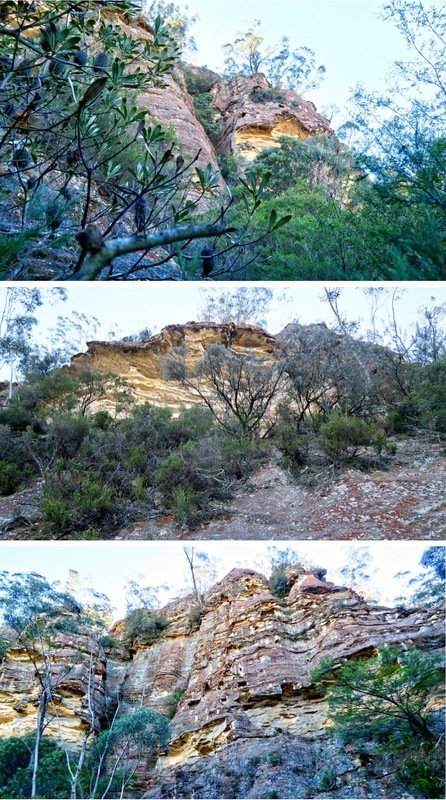 Ever since climbing to the top of Mt Tricky West, we have been walking in a north-east-ish direction. 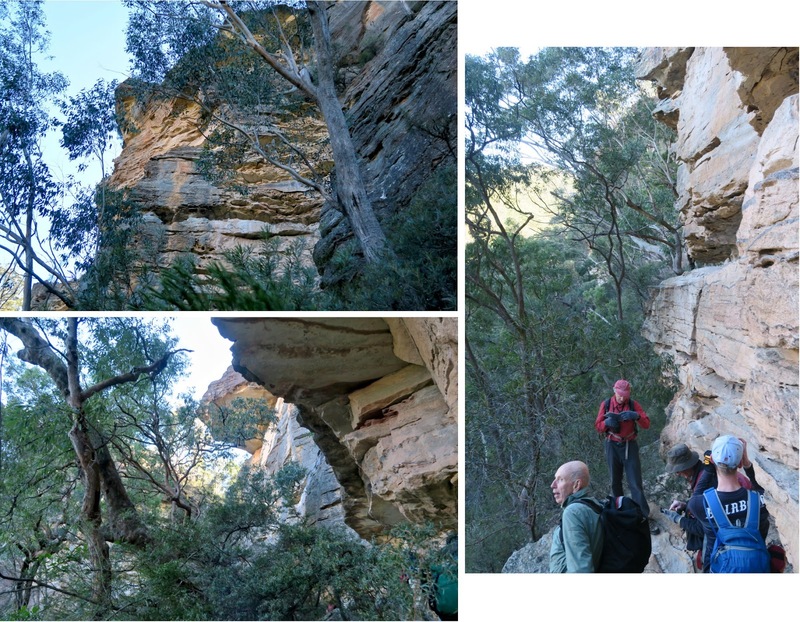 After the lookout of the previous pics, we turn sharply to south-south-east-ish direction, heading towards Cathedral Pass which will take us back to Newnes. - Right pic: I've climbed down and watching HT coming down. 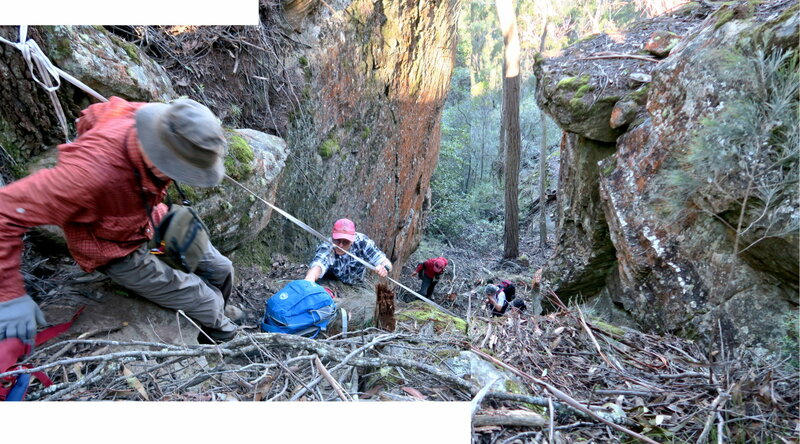 66) We come to a cairn (GR 420 274) marking the start of the steep Cathedral Pass which will take us back to Newnes. 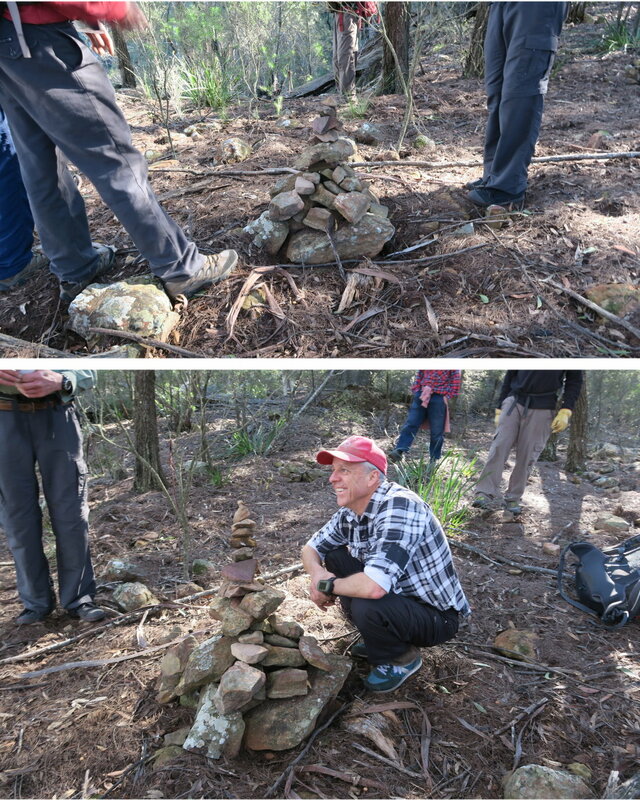 - Upper pic: The cairn as we find it. 68) It is like inside a rainforest. 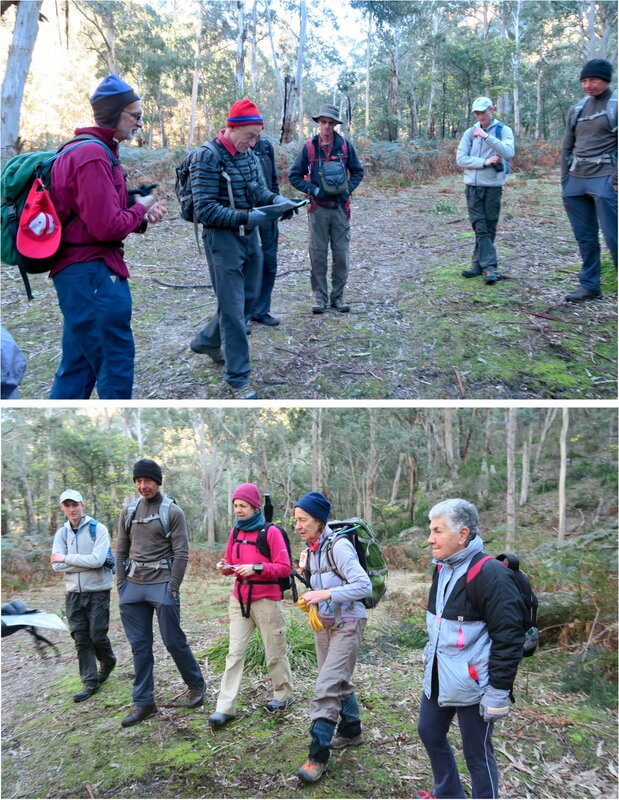 69) We are at the end of our walk at Newnes Campground at the confluence of Little Capertee Creek and Wolgan River. 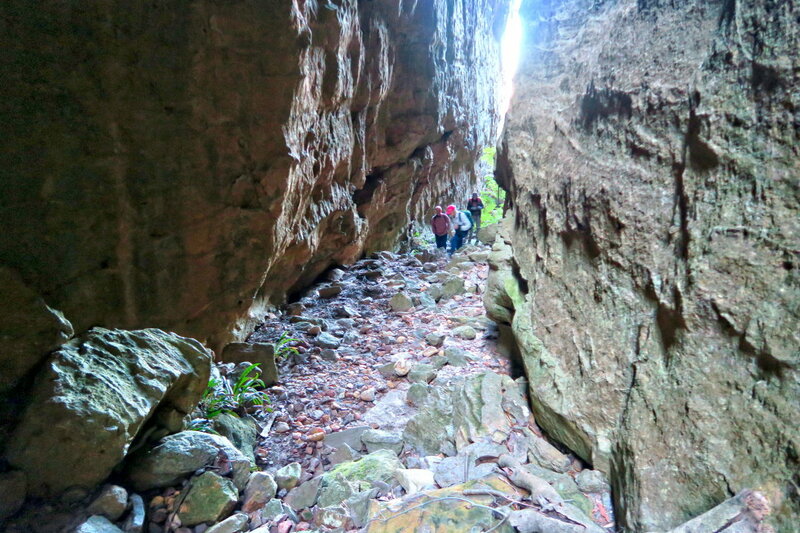 The campground is like the inside of a bowl with cliffs all around it. - Upper right: Towards north-west is the southern tip of Mt Tricky West. Where we had our lunch (photos #51 to #53) and the lookout of photo #54 are further back behind this cliff. Cathedral Pass is beyond the right edge of this pic. The Altar Room is a fascinating passage. You must walk through it one day ! Great fun, I'm jealous. 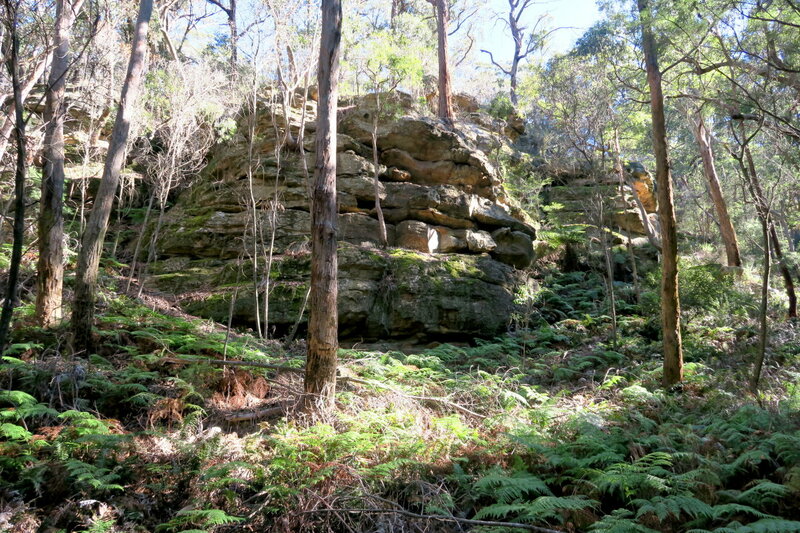 I got lost in Wollemi once - alone by myself. 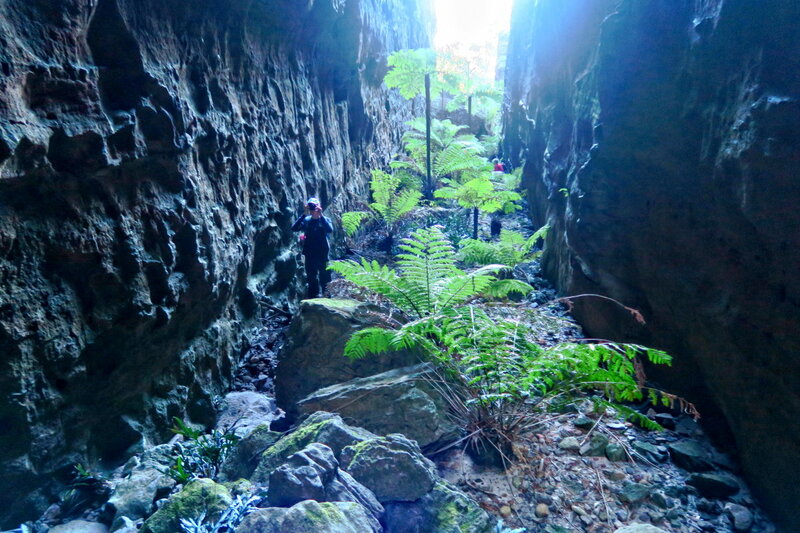 It is easy to get lost in the Wollemi.